We also conduct specially designed workshops for corporate houses which are fun, easy and stress busting. We have regular weekend workshops at Sofitel, Grand Hyatt, palladium Hotel, Hyatt Regency and other hotels across Mumbai every Sunday afternoon. Discover Art: 3 – 6 year old: process-oriented art for your child, build confidence and keep art fun! For this age group, ART is more about EXPLORATION…at this age we don’t believe teaching a child to draw is appropriate. Hence the focus on the PROCESS. Our approach does not expect particular outcomes. We encourage our little sparks to first EXPLORE the art materials around her – paints, crayons, sponge, brush, basic colours, etc. We gradually inspire them to talk about ‘their IDEAS’ – shapes, colours, contrasting colours, themes from daily life, etc. Simultaneously, depending on the choice of their theme, we begin introducing TECHNIQUES – colour mixing, splatter painting, dabbing, etc. But all this time most importantly, we let them explore art in their own way while we stand back. We believe FREEDOM and ENCOURAGEMENT at this age do have a marked impact on the child’s self-confidence and enjoyment in art and learning as they prepare for older years. Children not only learn all drawing, colouring , painting and different forms of Craft but also Art appreciation, art history and techniques. This program is designed to teach basic to advanced drawing skills, art techniques and vocabulary to children of ages 6 to 12. It focuses on different forms of art and craft. Our kids learn about Indian folk art, world art, techniques of art, master artists, mixed media and a huge range of art subjects that are thought provoking! Holiday Artventure – Holiday in Summer and Diwali every year where children are introduced to concepts and techniques based on specific themes. Unearthing the creative you – Art appreciation modules for professionals and corporates – encouraging lateral thinking, breaking out of a routine grind to bring in new thinking and energy at work. ARTY BIRTHDAY PARTIES – Lighthouse organises art themed parties where children not only have lots of fun but also learn to create a masterpiece to take back home. Lighthouse also makes personalised return gifts. @ Phoenix Market City, Kurla – Regular weekend workshops on Saturdays and Sundays from 2.00pm to 8.00pm. 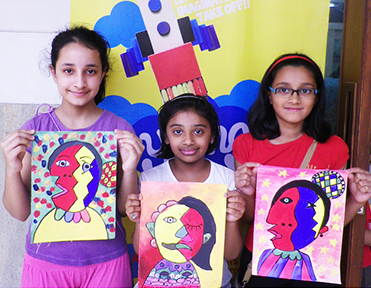 Lighthouse has designed a world class Art and Craft curriculum for schools from Pre-primary to Grade 5. This can be integrated with the school curriculum through which the child can discover and interpret the world around them in their own way. The curriculum offers a new mode of learning by giving children opportunities to think as they explore, express and interpret art with its different aspects. The Lighthouse Art and Craft Curriculum is already running in a few schools across Maharashtra.